We’re Back! Sorry for our absence. A big thank you to all who ordered this past weekend and especially for those who kept ordering during our absence. We were overwhelmed after the last newsletter which is why this blog is being written at 2 am Monday morning. We will follow this blog up shortly with some comments on the latest Potter Auction. In this week’s blog, I will be addressing the question of restoration for all forms of magic collectibles. It is not my intention to discuss the how’s of the restoration process but rather simply address the question “Should I restore this item?”. Opinions vary widely on the benefits of restoration so what I am about to give you is my opinion only so take it for what it is. 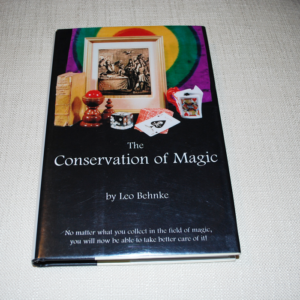 If you are interested in the care and restoration of your magic collectibles I highly recommend the book “The Conservation of Magic” by Leo Behnke. In it you will find everything you need to know about caring for your magic collectibles. As of this writing there is a copy available on my website (here) or you can buy a copy at Norm Nielsen’s website (here). I highly recommend it! 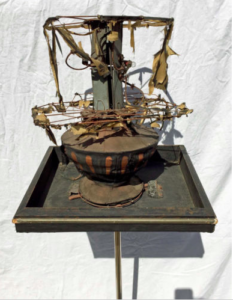 Apparatus: For me the question of restoring apparatus comes down to this issue: I want my apparatus to be functional. I believe it should work the way it was meant to. That sometimes makes up my mind on restoration. If something is not functioning properly, I try and find someone who can restore it to its original functionality. In the process for me it is important not to touch any more of the item than I must. In other words, I want to maintain as much of the originality as I can. Even in using various parts I want to remain as true to the original piece as I can so period parts are helpful if they can be acquired. For metal apparatus there is the debate over should I polish or not? Tough question. In general, I see if the patina is appealing to me. If it has a nice patina I leave it alone. I am not one however, who considers cleaning (polishing) an item a mistake. I figure the magician who originally owned it would want it to look its best so I am sure they would polish it occasionally. I feel all of you Antique Roadshow watchers cringing here. I do not see the same value deterioration of a polished magic prop as I do a refinished piece of Stickley Furniture. If you are going to polish a metal prop do just that, polish it: don’t remove the finish. Use a nonabrasive polish such as Flitz polish. It does not take off any of the finish. One instance where you should polish a metal prop is if you see a blue green scum like substance on it. That is acid and it is eating away at your prop. Polish it as soon as you can in this instance. The finish on wood apparatus for me is not that dissimilar from metal in that if it has a pleasing patina leave it alone. Sometimes the wood has aged or dried out and is not very pleasing to the eye. I would not refinish the item except in the most difficult of circumstances. There is a product called Kramer’s Best Antique Improver that does a great job in putting back the natural nutrients into the wood to make the finish look much better. It’s your call but I leave the finish as undisturbed as possible. Paint touch up. I generally don’t do it. Nothing looks worse on a prop than mismatched paint touch up. It stands out more than the nick or scratch that was on it. The only exception may be black paint and that is only on the edges of prop. Posters: The paper conservators have come a long way in properly caring for posters and other paper items. I almost always send my posters off for mounting and restoration. They key is finding a good conservator. Two I highly recommend are The Poster Repair Company in Baltimore Maryland (here) and Poster Mountain in Northridge California (here). They can do miracles. Posters were made to be seen in their original splendor. These guys can take a poster in poor condition (even missing pieces) and turn it into something you will be proud to hang on your wall. By mounting the posters using conservation techniques you are saving them for the future as this process helps de-acidify the poster (the enemy of all paper products) and just as important provides a solid foundation so you can handle the poster without fear of damage. Don’t let anyone near your unmounted Golden Age of Magic poster. Even handling it yourself will often result in unnecessary damage. They are so fragile in unmounted condition. Choose your conservator wisely. I have had more than one poster practically ruined by shoddy work. Pay the extra bucks for the best conservator you can find. The work that they do is generally completely reversible. The glues and products they use are water soluble. If a better method of conservation comes along, you will likely be able to convert your posters to it. When does a poster become a painting? I have heard that question asked many times as justification for not restoring a deteriorated poster. For me it comes down to dollars and cents. What does it cost for the restoration vs. what the poster is worth restored. Heavily restored posters obviously have less value than those requiring light restoration but If the image is scarce the “bang may be worth the buck”. I have seen posters missing as much as half be restored to their original beauty by the talented artist of the premier conservators. It’s your call based upon both dollars and cents and any obligation you may feel to salvage the poster from the trash. 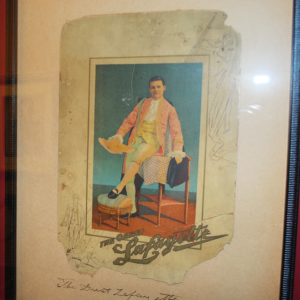 In a recent collection I purchased, there was a half sheet Otis Thurston Portrait that was just over half intact. I reasoned (and rightfully so) that I would have over $500 in restoration for a poster that would be worth likely less than $500 in that heavily restored condition. In a moment of difficult decision, I waded it up and threw it in the trash. I think about that often. I would never do that again! Money should not always be the main driver in every decision. 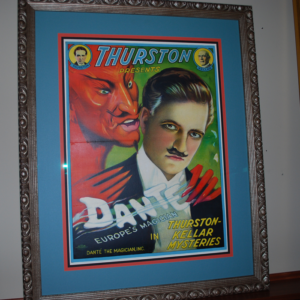 I acquired the Dante half sheet poster you see here in a collection I purchased. It was always one of my favorite posters and I was thrilled to get it. Only problem was the former owner had mounted it to particle board (as he had many of his posters). There was also some restoration required at the fold line and a small piece of the poster was missing (not a critical image spot) along with paper missing along the border in spots. I sent it off to Sei Peterson of the Poster Restoration Company with high hopes. When Sei received the poster he had major concerns that it would not come off the particle board (I think they always tell you that so they can be heroes later!). That was concerning because I hand sent him two more mounted on the same board. However, you can see the result: a stunning example of one of my favorite Dante posters. Magic Tokens: I don’t polish them. Probably comes from my old coin collecting days. I don’t think polishing magician’s tokens ruins the value quite like it does coins, but I still can’t do it. Books: I don’t have a lot of books repaired. There is a reason for that. I don’t own a lot of extremely valuable books. If I did own them I would seek out the best restorers I could find just like the poster people. There are people who re-bind books as well. I can tell you that it generally hurts the value of a very rare book to have it re-bound as book collectors like everything to be as close to original condition as they can find. Makes sense. I can also tell you that like poster restorers book conservators try to do all repairs in such a way that they can be reversed in the future. For more information I will refer you to Leo Behnke’s book “The Conservation of Magic” as he goes into great detail about preserving books and even discusses the repair of books that you can do yourself. Leo was a book guy so what he has to say should be read by all book collectors. Before I leave the subject of books there is one pet peeve I will share. I can’t tell you how many times I cringe as someone removes a book from my collection by grabbing it at the top of the spine to pivot it off the shelf. Please don’t do that. Reach into the top of the book about 2 inches pass the spine and pivot the book out from there. When the book is out far enough grasp the book in your hand to fully remove it. Association pieces: OK all bets are off. When it comes to association pieces I try my best to preserve that just as I found them and it is my focus to not make them any worse and to do my best to try and not age or damage them further. It is here that the word conservation comes into play rather than the word restore. If it belonged to one of the greats of magic (or the near greats) I try to maintain it just as I found it. There are exceptions and recently a big exception occurred. 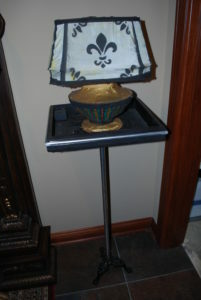 I purchased on eBay an appearing lamp once owned by Charles Carter and built by the famous builder Schlosser. Typically, I would just try to preserve it as I found it but look at the photo to the upper right. What the heck is it? There were even many on the Thayer site that found it amusing that anyone would want such a pile of trash. A quick call to my friend Paul Lembo ensued and after assuring me he could restore it I decided it was going to be mine. You can see the restored photo to the right as well. Paul did an amazing job. I even had Paul build the matching vanishing lamp so I could have the entire set as it was originally performed. This is a case where there was little choice except to restore the prop. It was not displayable or even recognizable as it was. These circumstances are unusual. The whole restore or not restore decision is not ever cut and dried. Sometimes there is not right or wrong: I am wrestling with a restoration decision right now. Look at the Lafayette card in the photo below. It is a beautiful piece of ephemera. Part of it is missing. It is on card stock so it is not like a poster. I framed it on the original scrapbook page where I found it. Should I restore it? I have not come to a clear answer yet. I believe it can be restored even though it is on card stock. I have seen card stock reduced to a single layer to have it mounted on “linen” and then restored. I know I do not want to do that. I believe a good conservationist can find period card stock and make it look like it once did. However it has been on that scrapbook page for a long time. I have not made the final decision so stay tuned!